The Soil and Terrain database for Latin America and the Caribbean (SOTERLAC), version 2.0, at scale 1:5 million, replaces version 1.02. The update includes changes in the GIS file and in the attributes database. The topographic base of the SOTERLAC map was adapted to a version congruent to the Digital Chart of the World. The SOTERLAC attribute database has changed in respect to the number of ... pedon attributes that can be stored. Contrary to the preceding, compact version, version 2.0 can accommodate all pedon attributes considered in a 1:1 million scale SOTER database. 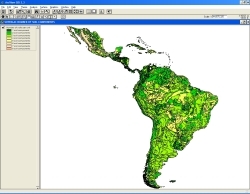 Terrain Database for Latin America and the Caribbean (SOTERLAC; version 2.0). 436bd4b0-7ffc-4272-be57-686b7d7eea7d Access to the portal Read here the full details and access to the data.